Those of you who actually come here to read this blog (and not because you found this while searching on Google) will probably appreciate hearing from someone other than me. While Citizen K and Corco both are taking Mariners hiatuses (hiati? ), they're still very much welcome to park their thoughts here, and I completely look forward to reading their posts as time allows them to do so. In the mean time, I've extended a contributor's invitation to marc w, whom many folks will know from Lookout Landing and the other blogs his comments appear in. Thankfully, for all of us, he's agreed, and will join us here at Mariners Morsels (aka "Free George Sherrill"). I'm certain his knowledge of sabermetrics and his love for the M's will add to this blog considerably. Please join me in welcoming marc w! Coverage of FanFest 2006, from a reporter's perspective, is scattered across the area newspapers. The Olympian, The News Tribune, the Seattle Times, the Seattle Post-Intelligencer all have stories. Heck, even MLB.com has a story on the Mariner's FanFest. So why even waste more pixel space? Truth is, bloggers see things differently than reporters do, and everyone has a story. Here's mine. While waiting in line (my brother-in-law and I got there just before 7 a.m.), I tried to liveblog on my Palm-OS PDA-Phone. Unfortunately Blogger wouldn't let me log in, so I hijacked some bandwidth and diary space from Jeff, Devin and Trent over at LookoutLanding. But when I tried to edit my initial post, my Palm-based browser wouldn't let me save things. Fortunately, Deanna had the liveblogging covered (edit: but she's since switched it over to a more comprehensive -- and comprehensible -- post)! In fact, since Deanna, Dave (my brother-in-law) and I basically hung out the whole time together -- I'll send you over to her place to read about our FanFest experience. You should also read Conor Glassey's blog on FanFest, too. I've been trying to get this down for days now, but in spite of the fresh air helping me tremendously (especially early in the morning waiting in line), I'm fighting a horrible cold. One thing new this year, though, was the booths for fans to try on replica uniforms, sized to what actually fits the player. While the Sexson jersey looked a bit big on Deanna, King Felix's jersey was just right -- especially while showing the "Vote for Felix" t-shirt she was wearing. Around the corner, too, there were actual game-used bats - a few of Sexson's, one of Jolbert Cabrera's, and a few of Greg Dobbs (amongst others). Obviously the Dobbs bat had barely been used. The gentleman told me that the team store actually had some game-used bats and other stuff for sale. Cool! 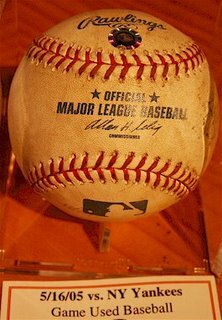 A game-used baseball from the 5/16/05 game against the Yankees. Exactly when it was used in that game, I'll never know, but since I bought it from the M's team store, and it's MLB authenticated, I'd almost bet my house it was used some time during that game. I'm not sure if batting practice counts, though, so that's still a possibility. So what's the big deal about that baseball? Well, you see, a quick look at the Mariners Morsels archive should instantly jog your memory. On 5/16/2005, George Sherrill made his 2005 M's debut. He replaced Shiggy in the 7th with the bases loaded and one out, having come in to face the hottest left-handed hitter in baseball (at that time in the season). With a grounder to third, Beltre threw the ball home, Olivo stepped on the plate for the force, threw the ball to first to Richie Sexson, who proceeded to drop the throw, keeping the bases loaded. Out goes George, in comes JJ Putz. Bernie Williams, another lefty, hit Putz' first pitch over the center field fence, for a 5-2 Yankees' lead. While both teams scored another run a piece (the M's in the bottom half of the 7th), the M's proceeded to lose the game. And George Sherrill proceeded to lose his 25-man roster spot. While it wasn't likely due to his performance, it was disappointing and frustrating nevertheless. While I did have to look at the box score a little to fill in a few details, I remember almost everything about that point of the game like it happened 5 minutes ago. Sure it's just one needle in last year's massive loss column haystack. It's also the day that this blog became the central hub of the "Free George Sherrill" campaign. Now, I had the chance to also buy a game-issued jersey -- issued to George at some point in his MLB career-- but I think my wife would've killed me had I shelled out the $250 (so, as Deanna mentioned, I just got a picture of me with it). That baseball, however, will certainly be a sufficient token. One of these days, I hope, I'll get George to autograph it. When we all took the locker room tour, I happened to notice that the two best pitchers on the M's staff (one starter and one reliever) actually are locker neighbors. Well, I suppose it's entirely possible that they just threw some name plates up there for effect, and since only Jamie Moyer's locker had anything in it, that may not resemble reality. I still thought it was cool (even if I couldn't get a great picture of it). Yes, I talked to Howard again. When I got the microphone, I reminded him that I came up here last year and thanked him for giving Bavasi the cash to land Beltre and Sexson (ch -- as if he even remembered...). This time, however, I was there to ask him for more money. During Bavasi's Q&A earlier, I'd asked him about Jeff Weaver. As I suspected, the issue was moreso due to money than anything else. In my off-mike conversation with Bavasi (thanks Deanna!) after the session was finished, I asked if an extra $10 million would help (thereby increasing the budget to north of $100 million). He said "Of course!" but that he also thought it was wise to keep the business side of things under control. Howard pretty much gave me the same answer -- they'd already spent a ton of money, and in spite of the Seahawks' success and how winning has brought them to the fiscal forefront, he thinks the M's chances are pretty good as-is. They certainly don't want to see another 90+ loss season -- and he basically put it back on the players, saying that they all underperformed and were disappointed in their performances. Well, Howard, the cash to sign Weaver (and bumping Meche out of the rotation, if not off the team) would seriously help solidify the chances of the M's seeing 90 wins again! Even though they have basically the same things every year, I really enjoy FanFest. It was good to hang out with Deanna, and (as Deanna picked up on) totally hilarious seeing everyone recognize my brother-in-law. Indeed, Dave's quite the M's groupie. He was even on TV on Sunday during the Seahawks' send-off. 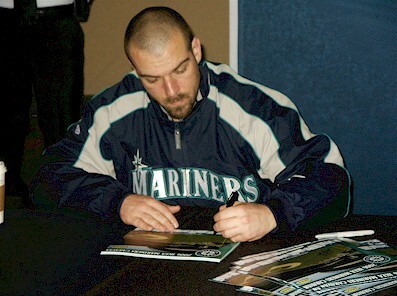 And, he was even cool enough to wait in line at FanFest again to get me Felix's autograph. I'm posting more photos over at my "Paul's Sports Photography" blog. Enjoy! They finally have the tentative schedule for autograph sessions up, and it's confirmed that both Felix and "Jo" will be there both days. Yay! So, my current plan to get there on Saturday (and possibly Sunday) before dawn should get me either Jo's or Felix's autograph. Even with Seattle's attention diverted away from the Mariners and on to the Seahawks, I'm still expecting a decent turnout, and (with Felix and KJ being there) a huge line well before the gates open. I'll definitely blog in the morning while waiting in line. I realize that there are several folks who won't be making it to FanFest this year, due to proximity and other committments. I'm not promising that I'll get to the Q&A, but if anyone has a question they'd like to ask, I'll try and ask it by proxy for ya. Leave your question as a comment, and I shall do my best. I've thought of a few things to ask Howard and Chuck this year, but I'm not sure I want to waste my time. If you are planning on attending Saturday, and would like to hook up, shoot me an e-mail (address is back on my profile). I'll make every effort to coordinate something between the few scattered people that have already discussed hooking up. It would be totally fun! 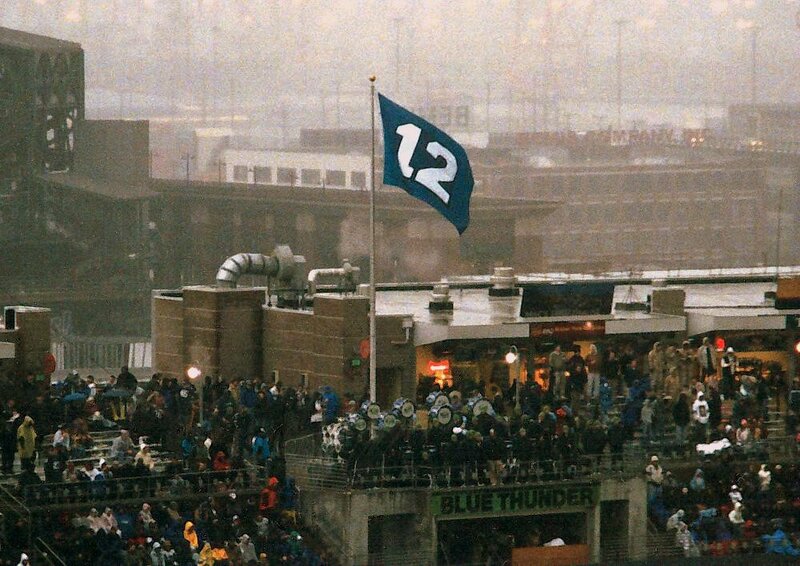 Well, the Seahawks just won the final game on the path to the Super Bowl. Now, I would've been spot on with the score, too, had I given their offense more credit (and Carolina's defense less credit). And, they're facing the Steelers instead of Steely-eyes' team (the Broncos). Congratulations to the Seahawks! Let's hope you left some mojo in Seattle for the M's. Bring home that trophy now, ya hear! With the Sonics beating the Suns in double-OT, on a Ray Allen 3-point wooden stake smack dab into their hearts, I was hoping the M's would make a huge move today, to top off the jubilation. But, as of now, nope. Nothing. At least we now know that Jeremy Reed is not going to Boston. That's good news in my book. While I would've liked some pitching help, it wasn't going to happen anyway. Next weekend is Fan Fest. I'm probably going at least once. Not sure when yet -- have to talk it over with the wife. There's been some talk of an informal gathering -- we can wait in line for hours together for Kenji Johjima's or Felix Hernandez' autograph (or both?). I'll try and figure out what's going on with the wife, and I have to let my brother-in-law know so we can make plans together. With Kenji being there, the lines should be long by 7 a.m. -- meaning I'll likely be there by 5 or 6 a.m. on the day I do go. I realize that's waaaay early, but seriously, that's probably the only way you'll have a decent chance at Kenji's autograph. It's actually quite fun to hang out there that early -- specially if there's more than two of us. I'll have a better keyboard so I can blog a bit, and I'll probably also bring a book. I'll definitely dress warmly. But I know for sure what I'm doing two weeks from now. Super Bowl Extra Large, baby! Seahawks over the Steelers 28-17. Super Bowl Trophy Before World Series Trophy? I've mentioned it before that my first loyalty to a Seattle sports franchise was to a) the Seahawks and then b) the Sonics. I didn't become a Mariners fan until I started collecting baseball cards during my jr. high days (1986). It didn't take me long to catch the addiction (both baseball card collecting and baseball watching). I'm old enough to remember fanatically watching Wes Unseld barely get past the Sonics in the 1978 finals, and then seeing the Sonic Boom crush the Bullets in 1979 (I still have the record somewhere) -- becoming the first major league sports franchise in modern history to win its league's championship. OK, Seattle won the Stanley Cup back in 1917, but that was the year before the NHL even existed, and when's the last time Seattle had an NHL team? Right. So, the Sonics won their title back in 1979. Fast-forward to 2004, when the Seattle Storm took the WNBA title. Some people would say that the WNBA doesn't qualify as a major league franchise, but I have huge issues with that. It may not be entirely as popular as the other Big Three in town, but The Storm still qualifies in my book as a major sports team. Seattle has an NBA title, a WNBA title, and (before the NHL existed) a Stanley Cup (and were the first non-Canadian team to win it, to boot!). Fellow Lookout Landing reader, Goose, made a $100 bet back in 2000, that the M's would win the World Series before the 'Hawks won a Super Bowl. Up until the Seahawks' October 23rd game against the Dallas Cowboys (and, heck, the whole 2004 M's season before that), I would've made that bet myself. Rewind to 2001 -- the M's cruised to a 116-win season, in spite of some glaring shortcomings with their pitching and hitting. Lady Luck was good to the team -- so much so, she's completely shunned them in the last two years. Several players had career seasons, and a rookie from Japan didn't need an adjustment period, and took the league MVP award. Going into the playoffs, they were highly-favored to take it all. Unfortunately Aaron Sele's post-season winning streak didn't start that year (he's still waiting to this day...), and the M's potent offense (having been bolstered at the trading deadline with Al "Football" Martin) was no match for Roger Clemens, Mike Mussina, and Andy Pettite. Coming Sunday, the Seahawks will battle the Carolina Panthers for the NFC title game and a trip to Super Bowl "Extra Large" (XL) in Detroit. I hear I'm not the only MarinersMorsels author who likes Seattle's chances against Carolina. Like the Mariners in 2001, the Seahawks have the league's MVP and a rookie who didn't need an adjustment period (though, in the 'Hawks case, that's not the same person, in spite of Tatupu getting the shaft for D-ROY). The thing that sets the Seahawks apart from the 2001 M's in my mind, though, is that they truly have talented players having good seasons, collectively, but outside of Shaun Alexander, no one is having a 'career' year. Certainly one could argue over how long Lofa Tatupu can play at the level he's playing at. The 'Hawks defense lead the league in sacks, but no one single player had double-digits. I just don't see Lady Luck hovering over this team. I suppose Jay Feely would argue with me, but that collective success really puts a lot of pressure on their opponents. They have multiple weapons at Wide Receiver, and a QB who actually knows how and when to fire the gun. They have the league's best offensive player in Alexander, but as the 'Skins game last week showed, Mo Morris and Mack Strong can handle the reins if he's knocked out. Their defense has improved every week, and while it's probably their weakest link (special teams? ), they are still very, very, very good. And, to top things off, they have a coach who's been in this situation before -- only to take his team to the Promised Land. Twice. That's OK, ML, I've Got My George Sherrill Ball Now. Now, if you don't know by now, I'm probably George Sherrill's biggest fan outside of those who are related to him. And, I'm also an avid baseball card, autograph, and other memorabilia collector. So, naturally, one would assume that I would have a nice little collection of George Sherrill autographed stuff. Actually, up until today, the only thing I owned (other than this web log, of course) was his 2004 Tacoma Rainiers card that came with the set I bought from the team store earlier this year. Every year the Tacoma Rainiers usually have a free autographed baseball giveaway. You have to get there early, of course, and once you finally go through the line, they give you the baseballs in a little paper bag. You have absolutely no idea who you're going to get. Of course, it's relatively easy to get autographs in Tacoma anyway, so why it's such a big deal to go to autographed ball night, I'm not exactly sure. This year, thanks to my brother-in-law getting there WAAAAAY early and letting my then 3-year-old cut in line with him (rather than having to wait in the hot sun with a 3-year-old) , I got two bags (one for me and one for my kid). The first one I opened contained an autograph from Ramon Santiago. Hmm. Neat. The next one I opened had one from Damian Moss, that game's starting pitcher. Hey, that was pretty cool. Obviously I got nowhere on that front. So, the three of us found our seats and, as per usual for me at Cheney, started gabbing with folks around us. One of my coworkers was a season ticket holder last year, and we sat in his general vicinity. He also knew of my general George fandom, and pointed out this gentleman that had received a George-signed ball, too. It seemed like they were popping up everywhere, except in my hands! I approached the gentleman and gabbed with him a bit, then asked if he'd like to swap the George ball for my Damian Moss ball -- emphasizing that Damian Moss was the night's starting pitcher. In spite of my best finagling, he was a Cheney regular, and was well aware of talent gap between Damian Moss and George Sherrill. In this particular section, especially, George had a bit of a following. He was one of the guys who would chant "We Want George!" when Masao Kida trotted in from the 'pen in a save situation. Any chance that swap was made? Nada. A long story and a few months later, I have my autographed George Sherrill baseball. After leaving work, I got to the mall at about 1:30. I gabbed with Aaron, the Olympia team store manager, for a bit, and then grabbed some lunch. I didn't really expect to see anyone waiting in line that early, but I wanted to gauge the scene. If Felix, Richie, Adrian, Raul, Kenji, or Ichiro were scheduled to have been there, well, there would've been a line at 1:30. Heck, if Jamie would've stayed on the bus, there might've been a few people around then. Anyway, so I took my time eating, stopped at a few places around the mall, and then went back to shop at the team store. I gabbed some more with Aaron, and then picked out an gift to give to George to pass along to elsid (I'll call ya later, Sid, and 'xplain). That killed about an hour. Finally about 3:30, a few other people started showing up. I was reading the blogs on my PDA phone, and then checked my e-mail. Once I replied to Larry Stone's e-mail asking for an e-mail address from the guys at Lookout Landing, I started gabbing with these folks. Just before 4:00, I noticed George walking in with JJ soon after. Then the rest of the folks on the caravan showed up to set up shop. I almost grabbed George as he walked down the mall, but decided not to bug him. It was totally funny how completely inconspicuous both he and JJ were. I seriously doubt if anyone other than me knew who they were. They strolled down the mall towards the food court. It took about 10 minutes or so for them to set everything up, and I noticed people from what I suspected was the local media starting to interview people. This guy with a $2000 Nikon digital SLR that I totally coveted was gabbing with the people who arrived early enough to be first in line. In spite of their generous recognition that I was ahead of 'em in line, I let them in, and let the line build up a bit before I got in. I wanted to be conspicuous, I suppose, and knowing that I wanted to chat with George a few, I didn't want to hold up the line too much. About 5 minutes later, the Moose showed up. Of course, when HE (or she, not sure which) showed up, the crowd went nuts. I'm quite certain I was the only one who picked up on the fact that George Sherrill and JJ Putz were able to walk inconspicuously through the crowd at the mall (aside from my near doing-so) completely without interruption . Contrast that with the Moose's arrival, and it wasn't even close. Heck, JJ and George probably could've been in half uniform, and they still wouldn't've been noticed (though they likely would've caused a little more of a stir were they in full uniform). A few minutes later, a gentleman came up to me and said "You're a Mariner's fan, right?" Being the generally friendly guy I am, I continued the conversation. After his second question, he introduced himself as Gail Wood, a reporter for The Olympian. I'm probably grasping at straws here, but in putting two and two together, I think he probably got a bit of a scoop from Aaron. I'd talked with Aaron quite a bit about my general fandom of George, and how I've become friends with his brother. I suspect he pointed Gail in my general direction to get a bit of the sub-story here. Anyway, Gail and I gabbed for a bit (I'm sure using 'gab' quite often aren't I -- I should grab my thesaurus.com), as he jotted down notes using my pen (his brand new one didn't seem to want to spit out ink). He'd mentioned that he was supposed to meet with George and JJ earlier, and didn't get a chance to. After spotting George down the mall a bit (with a fresh cup of Starbucks in hand), I pointed Gail in his general direction. He thanked me and rushed off to meet with George. It's a good thing I'd asked for permission to leave work early -- I divulged the "secret" of being a state worker to Gail, which will probably be mentioned as part of the story in the Olympian tomorrow. Of course, state workers have leave just like normal folks -- and I legitimately used mine, so those of you who complain about state workers (and that being an oxymoron) being lazy, tough. This isn't one of those times. To make a really, really long story short, the line started moving, and I got to approach George. The lady in front of me was kinda confused about the procedures, and held me up a bit, as I passed my baseball for George to sign. They were smart in getting a head start in signing all the mini-posters ahead of time. They'd only have to pause a moment for guys like me who had baseballs, bats, hats, shirts, and what-have-yous. But, of course, the line would have to pause a bit while I introduced myself to George. Gail had stopped me in line, and assured me that George knew of me, so I introduced myself as "Probably the biggest George Sherrill fan outside of those who are related to you" (paraphrasing a bit). We got to gab for a minute as I handed him the present with instructions to pass along to Sid. Yes, Deanna, he knew of this blog, though I don't think he's been here yet. He's got the address now, so we'll see if some comments start appearing from "GS52" or some other blogger name. Unfortunately, though, he had to take a rain check on my offer for dinner or coffee. 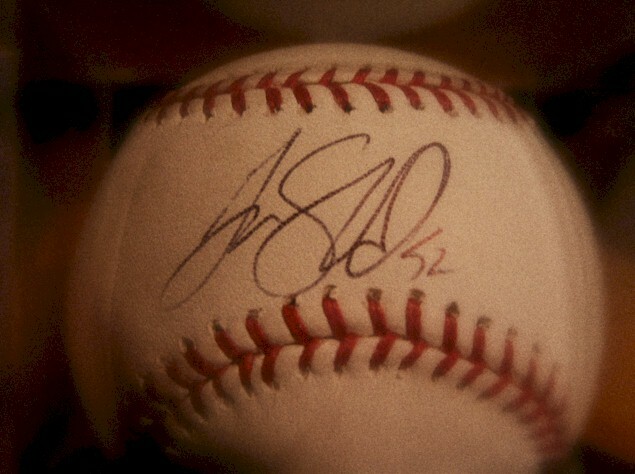 Well, I finally have my George Sherrill Autographed Baseball. I'm looking forward to see what actually ends up in the Olympian tomorrow about me and my experience. I Swore I Wouldn't Do This! I'm fairly certain the act has already been done in the M's blogosphere, but one of the things I considered doing with this blog was to take the questions asked on the weekly Mariners' Mailbag, and answer them how they REALLY should have been answered. I decided, though, that it just wouldn't be very nice. After all, this blog was founded partially to tone down some of the criticism of Bob "Pocket Lint" Finnigan, and I've really tried to shy away from the typical cynicism towards the mainstream Mariners' beat writers, columnists, and PIOs. I try to avoid being a jerk, and, as best I can, coming across as a jerk, so I really have to be careful with what I say and with what I do. However, I just couldn't resist taking on the one question that raised an eyebrow or two on a blog author whose blog's subtitle is dedicated to a fellow southpaw (even if that fellow southpaw pitches much, much better than the particular blog author could even dream of). Looking into your crystal ball, will lefty Matt Thornton be in the Seattle bullpen in 2006? At times he looked solid and other times he struggled mightily. -- Brad S., Wisconsin Rapids, Wisc. Thornton, who turns 30 in September, still has a couple of good things going for him. No. 1, he's out of options, meaning the Mariners risk losing him if they send him to the Minors. No. 2, he's still left-handed and throws very hard, which means he still has time to "figure it all out" and become a nasty big-league reliever. Those are the reasons he'll probably make the team out of Spring Training, barring injury. The Mariners' newest two relievers, Marcos Carvajal and Luis E. Gonzalez, have options, so the team can afford to have them start the season in the Minors. As for all of 2006, that remains to be seen. If Carvajal and/or Gonzalez, a lefty, are pitching a lot better and showing more upside than Thornton, it wouldn't be surprising to see Seattle make a change in the bullpen. Now, I realize that Miller's new on the job, having taken over for Jim Street several weeks ago. Before you get out those scissors to cut him some slack, I'll point out that he's not a newbie to the MLB beat writing scene. I would hope he knows about Rule 5 Draft stuff, even if he think's it's called the "Rule V Draft." See, Luis E. Gonzalez was a Rule 5 Draft pick (from the major league portion of that draft) that we inherited as part of the Torrealba trade to Colorado. According to "RV" rules (as I like to abbreviate it, of course, knowing full well it should be "R5"), any player that is drafted as part of the major league portion of the draft has to be kept on that team's 25-man roster, or offered back to the team he was drafted from for $25,000. It's the little rules like that which people employed to write for MLB.com (or any of its subsidiaries) should really be required to know. In stating that both Gonzalez and Carvajal "have options, so the team can afford to have them start the season in the Minors," he's showing that he completely missed this whole Rule 5 draft thing. The point I'm REALLY trying to make is that I'm not sure whether it's a good thing or a bad thing that George Sherrill isn't mentioned along with the list of lefties fighting for a job in the 'pen. That his name is omitted could mean that George is a lock for the 'pen, barring, of course, injury (knocks very loudly on the wooden table underneath this keyboard, enough to startle the bark alarm) . Now (unless you're one of the guys Miller mentions) you know that, and I know that, but there's still that whole "J-Rod Washburn and Carl Everett are NOT signing with the M's!" white noise that snows within the PositivePaul "Pos-O-Tron" (sorry, Dr. D -- but, then again, hey, wouldn't the Detect-O-Vision benefit from a Pos-O-Tron plug-in module? Hmmmm...). Indeed you have a clear picture of Thornton, Brad. Like his starting pitching counterpart, Ryan Franklin, he throws several good pitches every game. Unfortunately, it's the bad ones that hurt him -- and he throws several of those frequently, too. The Mariners appear willing to give Matt Thornton one more shot, as they've invested a good deal of time and money into their former 1st-round draft pick. But when they acquired Marcos Carvajal and Rule 5 draft selection Luis E. Gonzalez from Colorado, and then claimed Jake Woods of the Angels' waiver wire, Matt Thorton's sweat glands have to be pumping! Look for the four of these guys to battle for one spot in the bullpen -- if manager Mike Hargrove wants to have more than two lefties in the bullpen, that is. Eddie Guardado's option was picked up to handle the closer's duties, and lefty George Sherrill is a lock for the bullpen. Carvajal might end up in Tacoma to return down his development path as a starting pitcher. So, the battle could be down to Thornton, Woods and Gonzalez, with Gonzalez and Woods having youth on their side (Thornton will turn 30 next September, while Woods will be 24 in September and Gonzalez will be 23 in Feburary). I do realize that Miller likely has a word limit on his responses, nevermind a time limit to respond to them. Still, I feel that question deserves a better response. Add all that to the reality that the Hot Stove League is cooling off, with a good majority of the thin crop having been harvested. I really, really hate this time of year, especially living in Western Washington. Nevermind that the Rose Parade announcers thought that Mercer Island was a "small island off the coast of Seattle" -- this time of year really plays out the stereotypes of Seattle. It's dark when we leave for work, and dark when we get home. It's gray and rainy, and we rarely, if ever, get snow (at least on the west side -- where CK lives, they actually get some true winter weather). Now we find out that daily ticket prices will be increased. I haven't heard anything on daily tickets at Cheney, but since season tickets have gone up there, it wouldn't surprise me to see them rise a little. I love Safeco, don't get me wrong, but it'll take a lot for me to get there next year. You'll probably still find me in Cheney regularly, though. I really love seeing games there, especially when I can take my family and get tickets for all of us behind home plate for half the price of similar tickets at Safeco. And the umpire can actually hear me!